Alex Gordon brings more than most to the art of dance. As a performer with Cleo Parker Robinson Dance, and before that with Thodos Dance Chicago, the precise commitment of his performances is a dependable highlight every time he dances. As a choreographer, his works Residue and Amour Dévorant revealed a richly imaginative understanding of movement, but also of the use of lighting and music as elements of movement design. As a costume designer, Alex Gordon is increasingly in demand, and the insights he shares with us here about his work for Deeply Rooted Dance Theater show why. It may be just because he is a gifted designer, or it may have much to do with the depth of his perspective as choreographer and performer. In any case, his in-depth thoughts about the art of costume design offer a rare look into one of the most important and least understood details of successful concert dance. When I design and create I try to make each costume custom to each dancer. Because Desire had been costumed twice before, Gary and I had a chat about what he liked in each costume and what we could possibly bring to the third iteration. Right away I loved the vibrant red color from the second skirt design. I also loved the wild character the first design skirt had. The picture depicts all the female skirt pieces–cut out, bagged and labeled. When I design and create I try to make each costume custom to each dancer. The numbers on the bag correspond to the length of the skirts in proportion to each dancers legs. The sketch is a diagram of all the skirt lengths for each dancer which I created before I started creating the skirts. I have found that diagrams and mapping have helped to keep me on track and give me a larger perspective of the project as a whole! This picture depicts another diagram I created before I made the eight pairs of INDUMBA pants. Fana wanted each pant to have its own character. No two pants has the same pocket location or drawstring casing. The diagram depicts the location of each pocket I mapped out on the front of the pants. Fana wanted more pockets along the side or back of each pant as well, so during my first fitting in Chicago with the dancers I let them pick where they wanted their additional pockets. I have found that diagrams and mapping have helped to keep me on track and give me a larger perspective of the project as a whole! I believe that costumes should be an extension of the choreography. Good costuming can create its own movement ideas as well as highlight beautiful choreography that has already been created. When I watch Desire I could not help but want to see romance in the costumes. To me, the vibrant red panels that peek from under the Burgundy skirt represent passion and what we “Desire.” The green vines that crawl up the women’s bodies and around the men’s waists have a “Garden of Eden” appeal while the men’s skirts take on a more masculine warrior appeal while the back is similar to the design of the women’s skirt. I wanted to create unity between the men and women. The Ensemble ladies have vines that blossom along their stomachs, but the vines do not reach their breasts. The duet females’ vines creep up and encircle the breast, consuming the female as if she has tasted the forbidden fruit by being touched by man. The matchmaker is a bit more embellished than the other ladies. I saw her as the more experienced character who had an ability to join the male and female characters. I wanted there to be a slight difference in length and detail to reflect the hierarchy between the females while still creating a unified set of costumes! Besides the skirts, my favorite part of the design process was matching the skin tones of the ten dancers! I love the different shades of the Deeply dancers. This is another picture of the INDUMBA process. I had about two months to actually make the eight INDUMBA tops and bottoms, as well as the ten Desire costumes. 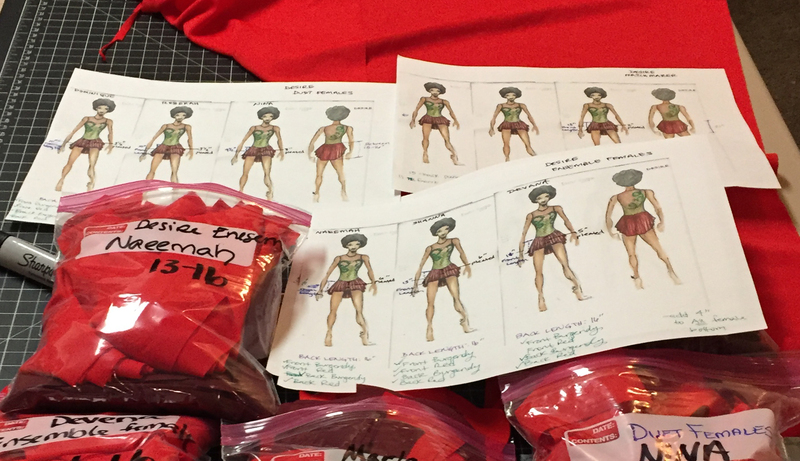 I spent the first month creating the INDUMBA costumes and the next month on Desire. However, I waited to dye the INDUMBA costumes until I was able to speak to Fana in person during the two day sewing, dying and fitting process I did Dec. 4-5th. I knew I would have no choice but to wait to finalize all the costumes. I needed to do one last fitting for Desire, which happened on the 4th, and then I spent most of the 5th finishing up the last alterations. During the night of the 4th and 5th I dyed INDUMBA. I think the hardest part of the process was trying to create original costumes for a dance company that was over a thousand miles away from my home. I loved the challenge though and I am so happy to get to work with such amazing people! Gary and I corresponded though email and texting. I tried to share as many photos and sketches as I could with Gary and his team to keep them up to date on progress!